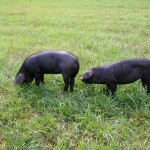 This is Isabelle and Jezebelle They are our Large Black Hog gilts we acquired September, 09. They are lounging around the pool. When they get hot they like to take a dip in the pool. 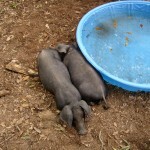 They will be too big to fit in this pool next summer so we will need to make them a bigger one. This is Jezebelle relaxing after playing with her toy. They like to chase each other around trying to get toys form each other. They are not too picky on what they consider a toy. 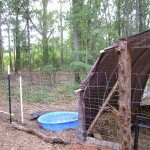 It can be a food dish, the water bucket or your boot! We are training them on what are acceptable toys. 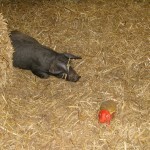 The pigs have a large wooded paddock to forage in. They love to eat acorns and root for bugs. They also have access to pasture where they graze in the afternoon and lay in the sun when it is cool. 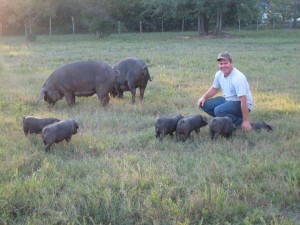 The Large Black Hog is an excellent grazer. They do not destroy the pastures by rooting like some breeds. The variety of forages they receive produces a high quality pork product. 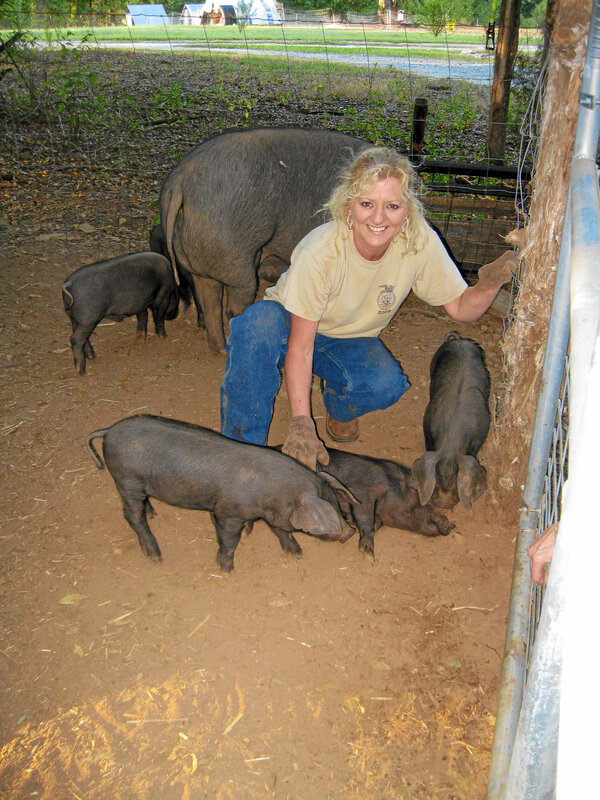 It is hard to believe that the two little pigs in the pictures above are now the big ones in the background of this picture. Here are some of the pigs from Isabelle and Jezabelle’s first farrowing. 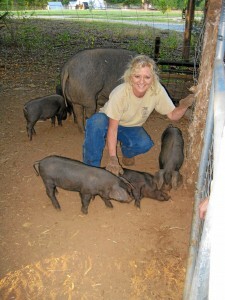 Here is Helen with some of the pigs born September 2010. They are growing like weeds because they get skim milk from our Jersey cow and eggs from our chickens to supplement the grass they eat. 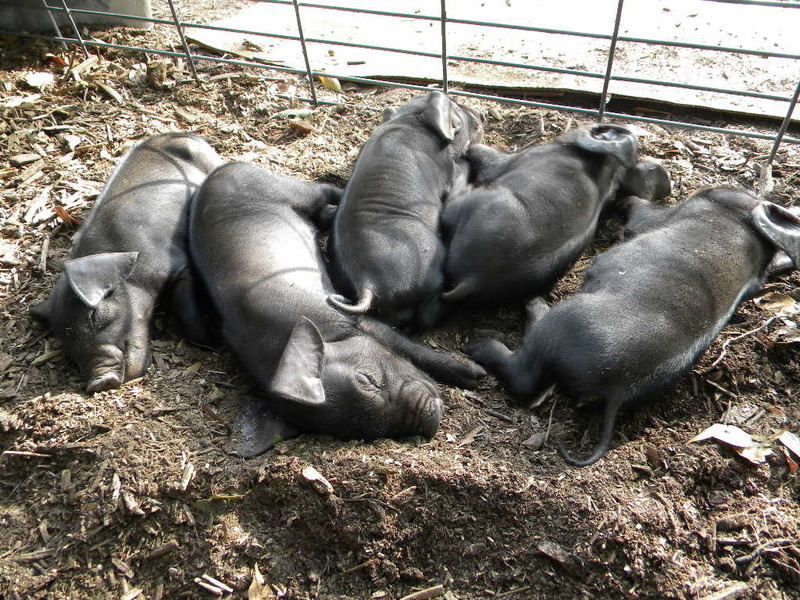 After they get their bellies full its time to take a nap.